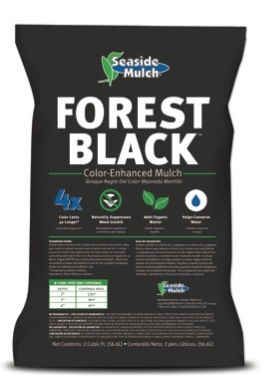 Forest Black™ is manufactured using superior colorants and the highest quality wood fiber on the market. No construction debris or pallets are used in our production process, only 100% virgin wood fiber. 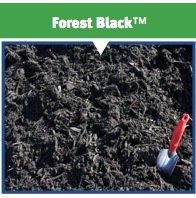 Forest Black™ will retain its vibrant color 4 times longer than cedar mulch or pine straw, and is wind and erosion resistant. Do not install if rain is in the forecast. Color-enhanced mulches never completely dry in the stock piles at our man- ufacturing plants and retail center. The colorant takes a mini- mum of 24 hours to cure to the mulch once spread. Do not irrigate for 24 hours. Irrigate BEFORE you install mulch. The mulch will retain moisture in the soil once the mulch is spread. 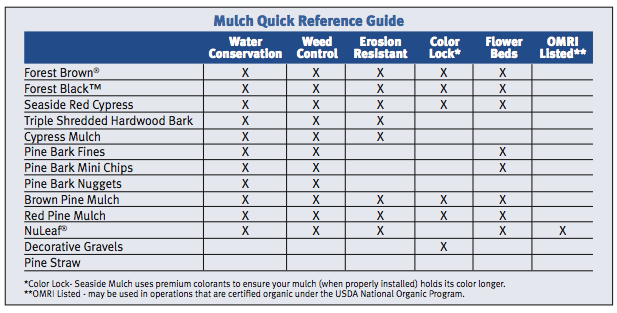 If proper installation instructions are followed, the color of Seaside’s color-enhanced mulches will last for over a year. Our premium colorants are non-toxic and safe for people and animals. They also contain no VOCs, making them safe for your plants, soil, and the air.